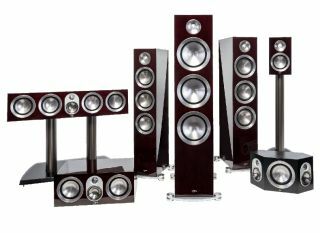 Paradigm Prestige speakers set for UK launch | What Hi-Fi? First unveiled at the CEDIA Expo in Denver last month [September], the new Prestige Series from Canadian hi-fi speaker manufacturer Paradigm is coming to the UK and Ireland this November. In the new range, you'll find three floorstanders (Prestige 95F, 85F and 75F); a bookshelf speaker (Prestige 15B); and two centre channels (Prestige 55C and 45C). The new range draws on the company's 30 years of speaker-manufacturing heritage, while also implementing "new technologies and expert engineering". One of the technological innovations is Paradigm's own Perforated Phase-Aligning Tweeter Lens, which is designed to both "protect" the aluminium dome tweeter and act as a Phase Plug. In terms of design, the Paradigm Prestige series takes on a minimalistic look based on sharp lines and "intricate detailing". The non-resonant cabinets are all handmade in Canada. Prices range from £1300 for the Prestige 45C in Walnut/Black Walnut or £1500 in Piano Black/Midnight Cherry to £5000/£5600 for the Prestige 95F. The other prices are: £1600/£1900 for the Prestige 15B; £1700/£1900 for the Prestige 55C; £3000/£3400 for the Prestige 75F; and £4000/£4400 for the Prestige 85F.